At Strait Smiles Family & Cosmetic Dentistry they are committed to satisfying unique individual needs and welcoming every new member into their compassionate & friendly family. 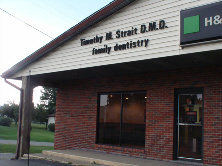 Dr. Timothy M. Strait strives to create the most comfortable environment for his patients and provides the highest quality of care. Strait Family & Cosmetic Dentistry understands that you won’t settle for anything less than the best, so that’s what they provide you with; the best! Strait Smiles invites you to browse through their website and learn about what they do and how well they do it. Strait Smiles Family & Cosmetic Dentistry’s mission is to help you maintain a beautiful smile for life! They provide restorative dental work, the newest cosmetic options, and education on proper home care to make that mission a reality. Dr. Timothy M. Strait’s team prides itself on offering cutting-edge technologies, methods, and products for the most comfortable dental experience possible, and beautiful, long-lasting results! At Strait Smiles Family and Cosmetic Dentistry they strive to be honest, ethical, and compassionate. Dr. Timothy M. Strait understands that it is their responsibility to help you plan towards a future of great dental health. There is nothing more powerful than a beautiful healthy smile! It has the power to create positive first impressions, light up a room, put others at ease, and make us feel happy. Dr. Timothy M. Strait’s team of dedicated professionals believes that the doctor and patient become a team for treating an individual’s dental needs. They dedicate time to listen, to understand your concerns and respond with the best treatment options for you. With the help of their professional staff, Strait Smiles Family and Cosmetic Dentistry follows up to make sure that general pain is relieved, problems are resolved, and your health improves. Dr. Timothy M. Strait and his team strive to help you accomplish your short and long term dental goals to help keep your smile healthy and bright!